Abby here -- and let me tell you -- I have 1920s on the brain! Now that Costume College has ended, the Royal Vintage travel schedule has died down just a bit for August, and Lauren and I are starting our prep for Gatsby Summer Afternoon in Oakland on September 10th! 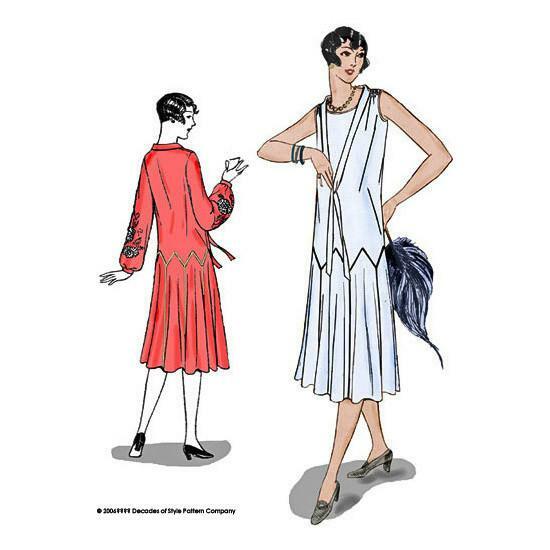 When I think of accessible 1920s and vintage dress patterns, one of the first pattern companies that come to mind is Decades of Style. I've been a fan of Janet & the company for a few years now and have a couple of their patterns already. Low and behold, while at Costume College I met a lovely lady who had on this great 1920s dress. When I asked her about the dress and she told me it was Decades of Style's 1925 Zig Zag pattern, I knew what I had to do. I was in love and it had to be mine. 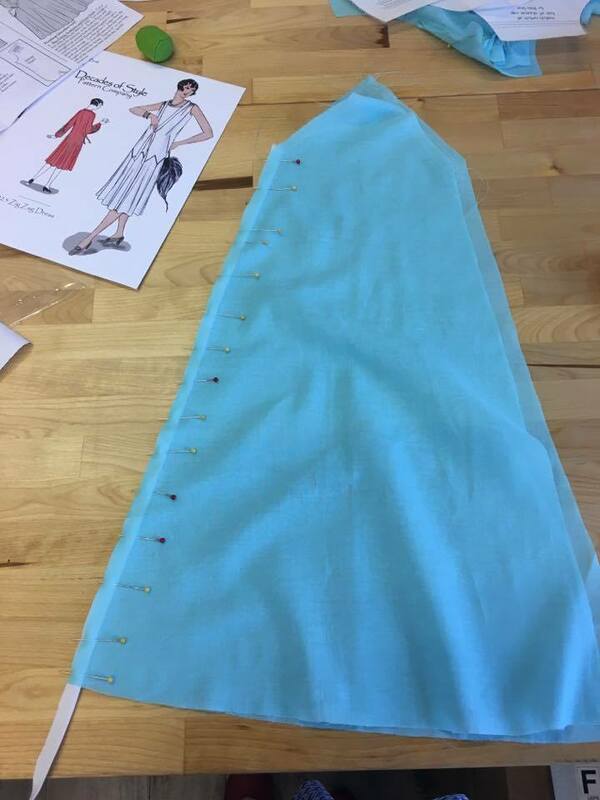 I already had some sky blue cotton voile in my stash that would be perfect and I decided to add white voile bias for accenting all the lovely seam lines, and so after I got my hands on the pattern I set off to work. I was very nervous adding the white detail to the skirt seams - since everything is thin and on the bias. It's still currently in 2 large chunks (skirt and bodice), but I am making progress! I was (and still am) nervous about doing the dress justice. My machine sewing skills are extremely novice compared to my handsewing ability. So it's been a very good learning experience for me. Not perfect, but I am very happy with how my white detailing is working. So that's where my new 1920s dress is at the moment...a productive work in progress. I'm also trying to decide on which shoes I want to wear with them. Currently, I'm thinking Evelyn in Brown/Tan - what do you think? Your dress is going to turn out lovely! I like the colors you picked. (This is a great pattern; I've used it twice because I love it so much). I'm glad you and Lauren will be going to the Gatsby Picnic; see you there! That's going to be gorgeous! I made the Zig Zag dress for Gatsby one year out of some silk chiffon with insertion lace. It's a lovely pattern. I hope to see you both at the Gatsby! Looking good! I'm fascinated that you are expert at hand stitching but a novice on a machine. That's so rare and wonderful! 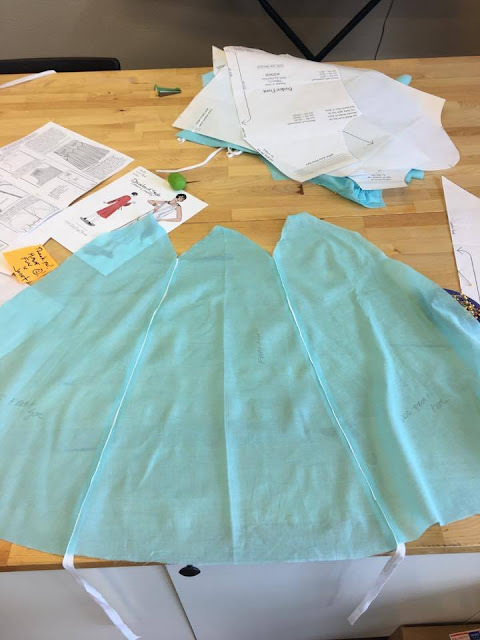 You can totally hand baste the skirt to the bodice for extra precision and peace of mind. Or even hand sew it.